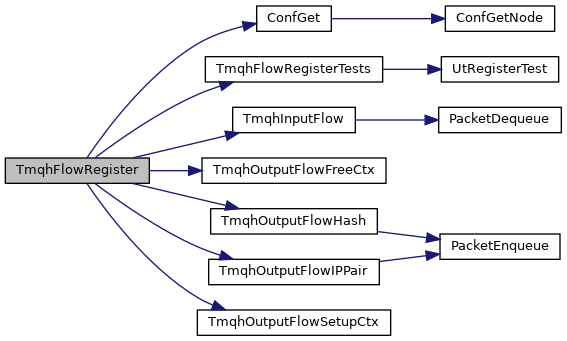 Ctx for the flow queue handler. Definition at line 82 of file tmqh-flow.c. References PRINT_IF_FUNC, TmqhOutputFlowHash(), and TmqhOutputFlowIPPair(). Definition at line 49 of file tmqh-flow.c. References ConfGet(), Tmqh_::InHandler, Tmqh_::name, Tmqh_::OutHandler, Tmqh_::OutHandlerCtxFree, Tmqh_::OutHandlerCtxSetup, Tmqh_::RegisterTests, SC_ERR_INVALID_YAML_CONF_ENTRY, SCLogError, SCLogNotice, TMQH_FLOW, tmqh_table, TmqhFlowRegisterTests(), TmqhInputFlow(), TmqhOutputFlowFreeCtx(), TmqhOutputFlowHash(), TmqhOutputFlowIPPair(), and TmqhOutputFlowSetupCtx(). Definition at line 423 of file tmqh-flow.c.